The crisp air of autumn inspires us to get outside and enjoy the season. One of the benefits of living so near a beautiful national park is taking advantage of nature’s majesty on a whim. Let the DVR record your favorite shows and spend a day in wilderness admiring the beauty that surrounds us. The Great Smoky Mountains National Park is full of waterfalls, from grand ones to smaller ones. There are three waterfalls within d riving distance. Stop along the way and get some coffee, hot cocoa or a steaming mug of hot apple cider and enjoy the bounty of nature’s harvest. Just 40 minutes from Gatlinburg sits Meigs Falls, located on Little River Gorge Road 13 miles west of the Sugarlands Visitor Center. Make sure to pull off to properly see it and take glorious photos without causing any traffic backups. The brilliant colors of fall framing the tumbling water will make all of your friends jealous. The Sinks is also reachable by car, and is only a 35-minute drive from Gatlinburg. The entire width of the Little River flows over this short waterfall, making a broad, low tumble into the river. A quaint stone bridge welcomes you to a parking lot where you can view the falls. You’ll find The Sinks 12 miles west of Sugarlands Visitor Center on Little River Gorge Road. The last waterfall you can reach by car is the Place of a Thousand Drips. Appropriately named, Place of a Thousand Drips is the journey of a low-flow waterfall as it gently tumbles along 20 to 30 feet of gently sloping rocks. The waterfall has weathered away sections of rock from the high cave from which it cascades, giving the viewer a glimpse into the past as they examine the different routes the water has eroded throughout its history. The National Parks Service provides the best directions: “From the parkway in Gatlinburg, turn at traffic light #8 and follow Historic Nature Trail into the park. Take Roaring Fork Motor Nature Trail (closed in winter). 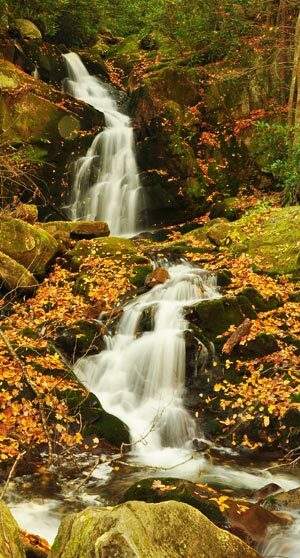 The waterfall is at stop #15.” All of the rain we’ve seen recently coupled with the glory of fall foliage is sure to create a series of fantastic photos. Are you interested in living near these majestic waterfalls? You can view our real estate listings for Gatlinburg, Pigeon Forge and Sevierville to begin your search for the perfect home. Whether you’re searching for a bargain in a distressed home, a luxury cabin, or anything in between, the Jane Terrell team is here to guide you to your dream home.